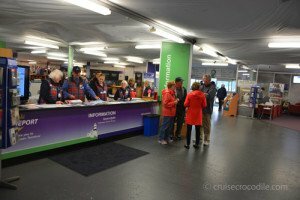 Our Greenock cruise port guide gives you information about the docking location, cruise dock, transportation options and much more! 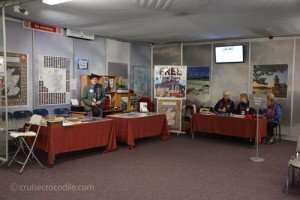 Welcome to the Greenock cruise port guide. Greenock is a friendly little place of 45.000 inhabitants. It is one of the major ship construction centres in Scotland, the birthplace of James Watt and so much more. Although travel guides often don’t mention Greenock, it is worth mentioning because of the people and their attitude on life. When you step into the terminal there are so many facilities there like tourist information, clan information desk and free tours through Greenock. All these volunteers come here because they are so proud of where they come from and they want to give you a piece of it. It is absolutely a pleasure to arrive in Greenock. 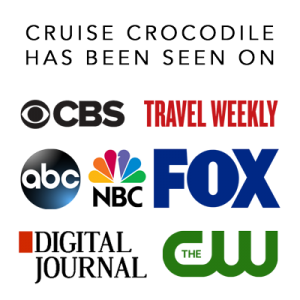 If it wasn’t for these people we would recommend you to get out of town, but in this case either stick around with the locals you’ll find at the cruise terminal for an unforgettable time or hop on the train to anywhere. 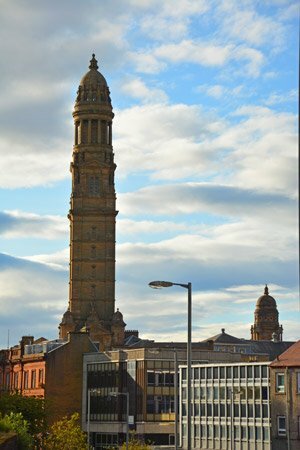 Greenock is the gateway to many destinations in Scotland. Visit Stirling castle, Edinburgh, Glasgow, Falkirk wheel or the Scottish Highlands or lowlands from here. This is the cruise terminal of Greenock. You will find it on the dock. In the terminal are several facilities like a enthusiastic team ready to answer all of your questions. These gentlemen are the hard working volunteers that truly want to give you an experience you won’t forget. The tours are free, but make sure to tip big. 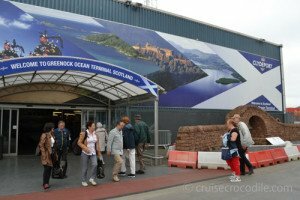 Cruise ships dock at Greenock’s Ocean Terminal. The cruise terminal of Greenock is full of information. There is tourist information desk, wi-fi and souvenir shops. The cruise terminal is only around 1 km walk from the city centre of Greenock. There are a couple of nice walks around the town or even hikes up the hill but that is about it. There are a hand full of volunteers that have such an amazing love for their region that they offer free tours in the cruise terminal. They don’t take you to anything mind blowing, but the fact that can step into detail about their region and tell you stories with such passion is what makes this worth it. Find them in the cruise terminal, but please know there is a very limited amount of spots available. You can also book online: http://www.inverclydetouristgroup.co.uk/content/tours/#tours The tours are free, but we highly recommend to tip big as renting buses and guides doesn’t come cheap. There is a taxi information desk at the terminal. They have several tours they can offer, but one way rides are also no problem. Except that a one way ride to Glasgow is 40 GBP. A taxi tour is around 30 pound per hour. There are 2 train stations nearby. We recommend you to go to Greenock Central so you can avoid all the steps going to West station. From here you can easily reach Glasgow and Edinburgh. You can check the train schedule through the following link: http://ojp.nationalrail.co.uk/service/planjourney/search . If you are planning in taking a trip to Edinburg, we not stop for coffee in Glasgow as it is on the way. You could take the bus to Glasgow: 901 or 906. They are leaving from the main bus station. You can also take the bus to Stirling castle. This takes about 2 hours though. From Greenock you take bus 901 or 906 to Dundas street, Glasgow. Walk 1 minute to the Glasgow Queen Street and take the train to Stirling. From here the castle is about 15 minute walk. The Scottish train system is very good especially when traveling to Glasgow and Edinburgh. Double click here to look at the train schedules. Although Greenock is officially on the lowlands the Highlands are literally across the water. Reach them by road or ferry. Take a scenic ride through these valleys to get a sense of what makes the Highlands famous throughout the world. There is a taxi information desk in the terminal. Please know that the price for a taxi is approximately 40 pound one way to Glasgow and 30 pound per hour. With 23 miles it is the largest stretch of fresh water in Britain. Loch Lomond is immortalised in the ballad: Bonnie, Bonnie, Banks. The beauty of Loch Lomond is known through Scotland. Cruise ships are welcomed at the Greenock cruise port center. This cruise terminal has superb facilities like souvenir shop, tourist information, taxi information desk and lots more! Make sure to read the full Greenock cruise port guide for all the information. It is hard not to fall in love with the city of Edinburg. Layers of history make this a unique city to visit and fair warning: one you get a taste of it, you want more. There are hundreds of historical sights in the city itself. Walk the royal mile from Holyrood Palace to Edinburgh Castle, visit the spot where Harry Potter was written or spend you day pub crawling. A day in Edinburgh will never be disappointing. This is the city centre of Greenock and the view you will have from the ship as soon as it is docked. Greenock is rather small with just 45.000 inhabitants and we would necessarily recommend to stick around. In the late 19th century it was the 2nd largest city of the British Empire (after London). It was the centre of the Scottish trade and industry. In the ’60’s she lost that position when the shipyards closed one by one. The past is still reflected in the architecture of the city: Classic Georgian facades, baroque palaces, victorian buildings display the wealth of the former industrial superpower.